A very big Thank you to everyone who was involved in making the Haggis Thrash happen on Saturday 28th April. I know it was touch and go as to whether it would take place at all after having been cancelled because of the awful weather we had in March. A huge amount of work went on behind the scenes to make it all possible by a group of very dedicated dancers, Ruth, members of her family and friends (Hazel, Kathy and Alison) and Sandy Nixon and Band. In the end it was a great evening, with good attendance, live music and a nice venue. Liskeard’s choice of dance programmes always provides a challenge but with Ruth as MC everyone on the dance floor had a great time and finished the evening in good spirits. 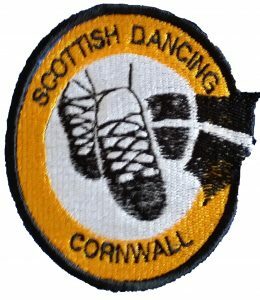 It seemed a fitting occasion for Brian Hooper, Chairman of the Cornwall Branch to present Ruth with a Branch Award acknowledging her long standing contribution to Scottish Country Dancing in Cornwall and beyond. It is through Ruth (on her travels around the UK dancing) that we have the opportunity to learn some different and interesting dances, and also be taught by some wonderful teachers and dance to great live music.